Never been much of a panfish eater, but i'm about to start keeping them all... caught a mess of blue gills on saturday and only kept the ten biggest. filleted them, which was not easy, i thought it would be easy like perch, but their bones are way harder to cut through. anyways heres the recipe, it was excellent on a left over onion as well. 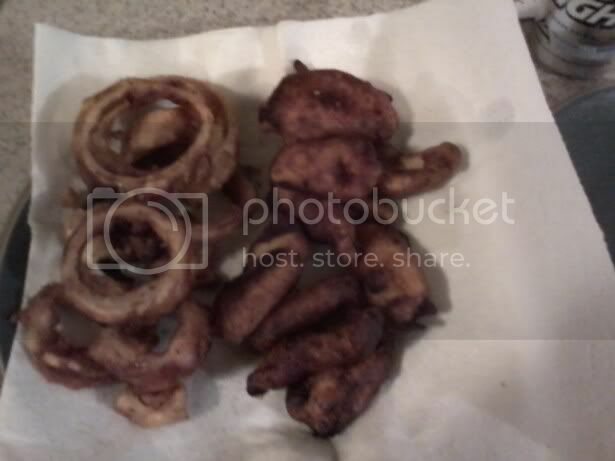 boil them in oil till brown, the sugar in the batter makes them pretty dark, but they weren't burned. You know Dune, with the way you cook, you'd make someone a dang good wife some day. Ain't that the damn truth, my old lady can only sorta cook 3 things... everything else she F@#$'s up! She cooks in another part of the house , so i put up with it. When my mom and dad got divorced, i think my mom tried training me to be a better husband, cooking was the only thing that stuck. Kinda like Ron White telling his wife, as the smoke detector is going off, "Honey, the food is done before that particular buzzer goes off."